UNCOMFORTABLE MOMENTS: The Hour Is Striking. 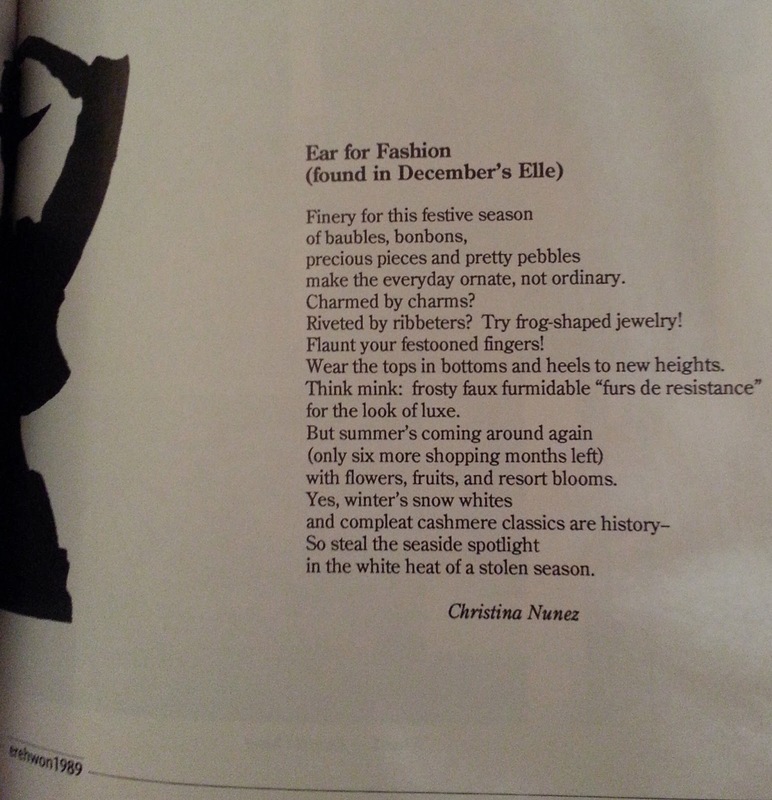 Recently I came across some old copies of my high school's literary magazine. My thought was the same as yours: poetry by teens. How embarrassing. I knew I had a poem in there somewhere. It was terrible. Here's the first reason why: It was a "found poem." That's where you don't actually write anything yourself. You just string together things that other people wrote and call it your own. Here's the second reason: I found mine in Elle magazine. That's right. I took selections of the silly copy that filled a women's fashion magazine and strung it together to make a tapestry of bad puns and excessive alliteration. Here's what I remember about high school creative writing class: I struggled to get a poem or story of any kind accepted for publication in Erehwon (you know, that's nowhere backwards); my teacher was one of the "cool" teachers who liked to wear a purple bandanna as a scarf and was either dating or worshiping the DC poet, teacher and publisher Richard Peabody, I can't remember which; we read a lot of Raymond Carver and once listened as a class to Jimi Hendrix's "Crosstown Traffic" to learn about metaphor; I was a good student and praised writer who somehow was not doing very well at writing creatively, at least in that milieu. I wanted to be doing better. As I paged through the old copies, the names came flooding back of the students who always won the "awards" that a panel of adults would give to what they deemed the best pieces in the magazine. Those entries in the table of contents got an asterisk next to them. And you know, a lot of the writing wasn't bad for a bunch of precocious teenagers. Many of the bylines in that magazine belonged to people who later became magazine editors, published authors, independent writers. I continued to study poetry, and to write poems, most of them appalling, but it was an outlet. It takes a supreme amount of talent and self-confidence to be a poet. Basically, you are assuming that you have such a masterful command of language that you will be able to paint the same picture that others paint with a far larger number of words, and do so without being melodramatic, obtuse, or ridiculous. I have only ever met one ordinary person who wrote poetry and was actually a stunning poet. We worked together. He was a kind of rumpled, often funny copy editor. One day he came up to my desk while we were working a weekend news shift and said, "Want to hear a poem?" He proceeded to reel off, by heart, a poem he had written. I was prepared for a joke at best, a supremely awkward moment at worst. I was not prepared for the poem to take my breath away. It was not a poem for me, nor was it a particularly romantic one. It was just an exceedingly good piece of work. "That was really good," I said, my mouth open. "Thanks," he said, and ambled back to his desk. I subsequently developed a crush and dating interlude that was annoying and inconsequential, except that this person introduced me to Haruki Murakami and Frank O'Hara, which is very consequential. Poetry can make you into a sucker. In my thirties I tried to keep my love of poetry alive, but volumes sat like museum pieces, unread. I would cut out the odd New Yorker poem, but stopped trying to learn about the authors. Today I regularly focus long enough to get through an article in that magazine (no small task), but even skimming the poems feels like a chore. It seems, now, harder to spend extra time on just a few lines of text, when there are so many other short phrases to wade through on Twitter, Facebook and the rest of the Internets that yield their meanings so easily and cheaply. I never found my found poem in those three unearthed copies of Erehwon (Deborah later did, above). After staring at them for awhile, I put them into the recycling. Then the next day I came across a poem in Yoga International of all places, a magazine I happened to buy at a Houston newsstand while killing time on business trip. that all my senses ring with it. to grasp and give shape to my world. All becoming has needed me. and they come toward me, to meet and be met. Maybe it is not time, after all, to put away poetry for good. Audio: "Having a Coke With You"